Try to set an appointment rather than taking a spontaneous call. It happens so often – the phone rings unexpectedly, and wham … your suddenly in the middle of an unplanned phone interview! Don’t get caught off guard. Simply say: “You’ve caught me at an inconvenient time, and this sounds too important to rush. Can we schedule a different time that’s good for both of us when we can talk?” You really need to prepare for a phone interview. Winging it is usually a bad idea. Set a time and date, and clarify who is to call whom. Go to a quiet place, and use a land line (not a cell phone) if possible. Try to arrange to take the phone interview call in a private place, with no noises or distractions. Land lines generally sound better than cell phones, and are therefore preferable. If you must use a cell phone, make sure you are in a location with good service. The last thing you need here is a dropped call! If you are at home, or someplace where there are others around – tell everyone that you need quiet and privacy for a phone interview to avoid interruptions. Nothing sounds more unprofessional than a crying baby, screaming kids or a barking dog in the background! Have a copy of the Job Description in front of you. Print it out, lay it on the table and refer to it during your conversation. (If you don’t have one, ask the person who set up the phone interview to email a copy to you in advance.) Think it through before you get on the phone, and prepare concrete examples of when, where and how you have done all the specific things described in that job description. Be ready to tell your stories and demonstrate with details how you fit each and every requirement they listed. Have a copy of your résumé in front of you. Print it out, and lay it on the table in front of you. Refer to it when asked about your work history, your qualifications, and your accomplishments. No doubt, the interviewer will also have a copy in front of them … so it’s best to see what they are seeing as they ask their questions. The Mirror Trick: It’s all about the sound of your voice – Smile! Since all you have is your voice here – you need to remember to speak clearly, and try to convey enthusiasm and energy through your tone of voice. Smiling helps (really, it does!) An old trick used by inside sales people is to set up a mirror in front of yourself, and look at your face as you talk. Smile as much as possible during the conversation. Try it … you’ll notice that you actually sound very different when you talk through a smile. It does subtly come through on the other end. Match the vocal cadence of the interviewer. Any good interview is a 2-way exchange of information. Let the interviewer talk and lead the discussion without interrupting. Listen carefully, and then give thoughtful answers. Answer questions directly and completely, but try not to go off on tangents or “over-talk” your answers. It’s better to give a brief answer, and then ask “is that what you wanted, or should I give you more details?” Candidates often get nervous and talk too much during interviews, trying way too hard to “sell themselves.” This is especially true during phone interviews where you don’t have any visual clues to tell you if the other person seems bored or restless. I can’t tell you how many times I’ve debriefed interviewers who complained about candidates who talked on and on and on during interviews, without letting the interviewer get a word in edgewise! Sometimes it’s better to simply shut up and listen!!! If you are interested in this job, make sure to say so! (“I just want to let you know that I am very interested in this opportunity, and hope we can move forward. What is the next step?”) Don’t hang up the phone without determining what the expectations are for the next steps, and how and when YOU should follow-up. Ask what their timetable is for hiring, and how their hiring process works. Also make sure you get the email address and phone number of the person you spoke with, and send them a thank-you email that same day. Then immediately make a note on your calendar of when your pro-active follow-up call will be if you don’t hear back from them first. If you really want this job, don’t just sit back wait for them to make the next move. You have to go after it! Entry filed under: Advice for Job Seekers. Tags: follow-up, interviewing, job-seekers, salary, unemployment. Very informative article. Gives you lot to think about. Thank you, Michael – you captured lot of helpful and relevant points. Thanks for the good article. I especially liked the mirror trick. Sometimes we get this one shot so we need to be prepared for it. Thank you for the phone interviews article because I had a phone interview today and I used your tricks and tips. It went very well, and I hope to get an in-person interview. The article is very interesting. I have shared it with some of my colleagues from university, because too often we feel trapped when it comes to phone interviews … We need to learn to “kind of” lead the conversation, and I think that this blog will help them a lot. Mr. Spiro – This was a great article! I, like so many others, lost my executive role in October of 2008. Although I’m working and the opportunity is ideal because I work from home, I do really miss the corporate world so I continue to interview. Thanks for the precious tips. Phone interviews can be hard to manage. Simply, candidates shouldn’t treat a phone interview any less seriously than a formal in-person interview. Many thanks Michael, with the big freeze (on hiring and weather) over – your posting is very timely for us in the UK. In a culture, where the everyday use of the mobile phone has made us blasé about the art of the verbal-only communication – your tips are ever more important to bear in mind. Thank you for taking the time. Great tips Michael. The one thing I’ve found in life is that the person who is prepared has a far better chance of success than one who waits for the opportunity. Being prepared also assumes there will be opportunity which is like a magnet to attract opportunities. Thanks for the Secrets,Tricks and Tips. I am an independent recruiter, having ran my own firm for more than 8 years. I appreciate the knowledge you have shared on your blog. I have learned many of the valuable lessons you have shared and share many of the philosophies and techniques you have outlined. Thank you for putting this together. I am sure it has helped separate you from competition as I feel it has for me. Michael – Very good roadmap and prep strategy for the phone interview process. I would add one other tidbit – research your interviewer (LinkedIn, Google). Doing so, helps you visualize who is it you are speaking with and create a virtual rapport with them. Michael, very thoughtful tips, thanks. I do have one comment/question. I listened to a teleseminar a couple of weeks ago put on by a career coach who suggested three different responses as a way of AVOIDING the compensation question during an early telephone interview. The notion being the candidate should have the chance to impress the employer, in a second interview, before getting into a compensation discussion under the assumption that once impressed the employer might show more flexibility with regard to compensation. I personally prefer the direct approach but I’m wondering if opportunities are missed as a result, any thoughts? Unless you know someone at a higher level at the company that you can reach out to (and bypass the HR Gatekeeper who will most likely eliminate you at the phone interview stage if you don’t answer the salary question) then I think avoiding a straight answer will do you more harm than good. I really enjoyed this article a lot! I don’t think as quick on my feet as I would like so this does give me preparation ideas…..slow down, schedule the interview, etc. Great advice, Mike. As a part-time voice actor, I’ve learned the importance of smiling and other “physicality” to convey interest and a positive attitude. The point about not over answering is also key – I think we all want to “sell” ourselves, which can all too quickly turn to oversell. Sometimes the best way to make a point is to ask intelligent questions and actively listen to the response. 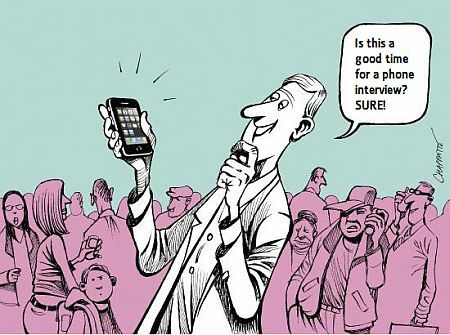 As you pointed out, the job seeker’s objective for the phone screening is to pass through to the next step. Good advice. The only one I have any issue with is setting an appointment for impromptu interviews. Most times, I prefer to talk to them because it shows that I have the ability to think on my feet and rapidly react to a situation. I am a recruiter who conducts 8 to 10 phone interviews a day domestically and internationally. While I don’t agree with the comment, “the goal is to eliminate you …” I think much of the advice here is relevant. I always schedule a specific time for the interview and allow the candidate to select a time convenient to them. It amazes me that when I call, I find people driving their cars or shopping or babysitting or sitting outside on a park bench with lots of noise in the background and they are not focused on the interview. If candidates don’t have questions or have not researched the company, I suspect that they are just blanketing websites with their resume and I am less interested in them. Don’t be afraid of the salary issue. Give a range and indicate whether you are flexible. If the interview has gone well, I will forward you to the hiring manager even if your salary is higher. My opinion is that it is a wise company that takes the opportunity to hire overqualified people. If you don’t answer the salary question when asked, you probably won’t get passed to the hiring managers. In closing, let me say that when I conduct a phone interview, the only thing missing from my perspective is the physical office and I expect the interview to be conducted in a focused and professional manner. Excellent informative article. Well done Michael Spiro. Thanks Michael, The tips regarding choosing the place to take the call and trying to do your talking through a smile were very helpful. I must admit I am prone to taking calls very seriously and obviously my voice would have come out serious but rather cold I imagine previously. The idea of using a mirror to do this on the surface seemed a little strange but after having given it a try and having applied it made me sound so much happier straight away. Once again thanks. this is really good… thanks a lot Michael. Good advice, things we know but forget in this market. After numerous e-mails and return calls to a director I conducted a call in a bus depot traveling to NYC. After returning the missed call to schedule it for another day I was told now was good. While the bus passengers moved about, I spoke of my work history apologized for the background noise and continued. I was told my background was too senior for the opportunity. Eliminate yes…. Matching the voice cadence is key for me, I speak faster during telephone interviews. As usual, Mike a very informative and helpful article. However, I do have to disagree with the comment ‘the goal is to eliminate’, b’cos more frequently the phone call is really to find the right fit. If the goal is to ‘eliminate’ there won’t be a call itself. The core point here is, “If you are seriously looking for a job, then take the phone interview session seriously.” Everything else about ‘Preparedness’, ‘Presentation’, ‘Persistance’ is accurately represented in this blog. Good job. Looking forward to seeing more. Mike, This stuff is great……so far everything I have read on your blog is so helpful. Impressive!, Impressive! Thank you SO much for this fantastic blog. I’ve had so many phone interviews where things didn’t go well. If I had read this first, I would have probably been able to avoid many obvious mistakes. I’m still working my way through your other posts, but I must say this is the best overall source of information for job seekers that I’ve ever found. Don’t stop writing! Very helpful, Michael. Thank you. Not a fan of phone interviews, and understand this is part of the “weeding” process. Great article with insight. Thanks. I love your blogs!!! Very informative! What are your thoughts around prescreening questions during the application process? I recently got knocked out of the running due to a yes/no prescreen question where they asked “Do you have demonstrated knowledge of….” and I didn’t want to overstate my capabilities. On the job req, this was also stated as a preferred not a required skill. Since I have a direct line of communication to the HR rep, I was also thinking of pulling some materials to show 1) my level of knowledge in that particular area, 2) my ability to quickly research and absorb new information in an area, and 3) demonstrate my interest in the organization and position. Do you also think that would be a good idea? Your idea about communicating your knowledge, flexibility, ability to learn new things and your interest to the HR rep is fine … but it may be too late if you already got “knocked out of the running” by answering the yes/no question the wrong way. It sounds like you are trying to un-do the damage you may have done. Any question on a application that asks if you have “knowledge of …” something should always be answered yes! “Knowledge of” is such a vague concept — and since it was not even a requirement, it can’t hurt to say you have knowledge of something. A few minutes on Google or Wikipedia will bring you up to speed on just about anything! Saying no to that type of question is a big no-no! Amazing blog … where have you been through all the searches that I have done in the past? Wow, what knowledge, practical, humble, and useful … Thank you! Just read the blog! A lot of really helpful “nuggets” of information here:) Ready to rock out on my interview today! Thanks for all your help.